Convenient Solution for Restless Hands! 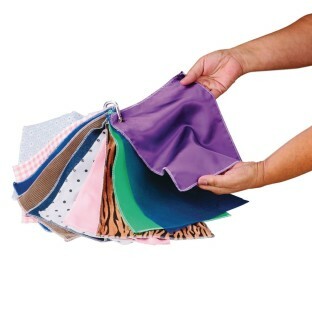 Set of 12 colorful, textured fabrics. Perfect for patting, stroking and folding. Use to calm agitated clients. Or as the basis for reminiscing and discussion. A convenient solution for restless hands! Colorful, textured fabrics are perfect for patting, stroking and folding. Use them to calm agitated clients or as a basis for reminiscence and discussion. Each swatch is approx. 8-1/2" x 11" with finished edges and a grommet for attaching to the included carabineer. Washable. The concept was great but the fabric selections were not terrible exciting. The swatches are connected with a carabiner and can be removed for cleaning. We use this product at our memory care unit for sensory stimulation. Much easier to order it through this website than going to the fabric store to purchase a wide array of fabrics. The variety is wonderful and clients seem to enjoy the feel of the fabrics.Clip that holds them together is sturdy and durable. This product is great for sensory stimulation. Play with eyes closed and have the residents guess which fabric they are touching.